I only had one student, Liz, but what a student she was. 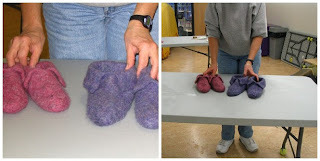 Never having felted before she came with the aim to not one but two pairs of slippers for her granddaughters. And as you can see she was successful! These two very sweet pairs of slippers will guarantee toasty toes this winter. Love these slippers and the ones you made! I've been meaning to make some for this winter and you just reminded me!